Friday Frolics - What's Your Ism? This week's quiz is about Your Ism. It comes with a set of interesting questions too. Take the quiz to find out What's Your Ism. Happy holiday too for those of you who'll be enjoying the Saturday off. This year, June 1 is Yang di-Pertuan Agong's Birthday. You believe in enjoying all of world's small and large pleasures. Life's too short to feel guilty. If it feels good, you do it. And you try to avoid pain at all costs, because pain is a major bummer. And while you enjoy the baser pleasures, like food and drinking - there's more to you than that. You find joy and delight wherever possible. You truly live well, and you're proud of that fact. Last Week's Quiz: How Are You Spiritual? 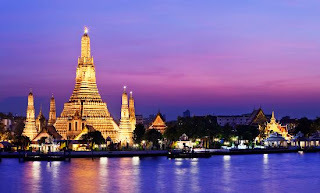 TripAdvisor.com is a travel website that assists customers in gathering travel information, posting reviews and opinions of travel-related content and engaging in interactive travel forums. 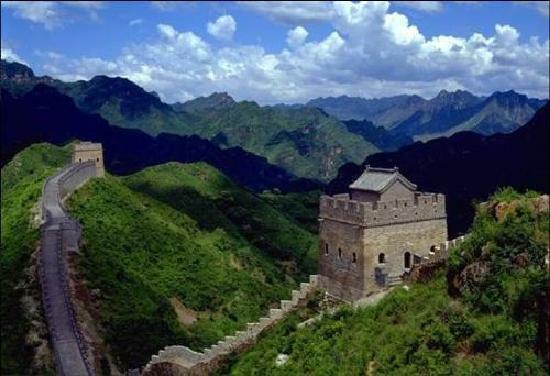 TripAdvisor is a website many travellers go to for information on a place or city they intend to visit. 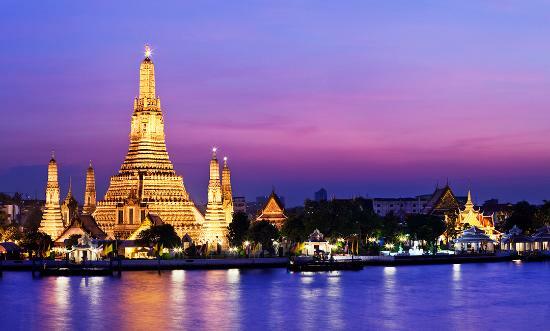 Eight cities in the Asia Pacific region made it to this year's TripAdvisor's list of 25 Best Destinations in the World. 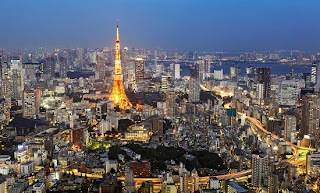 The cities are ranked according to travellers' choice. Here's the 25 in ascending order..
How many have you been too? 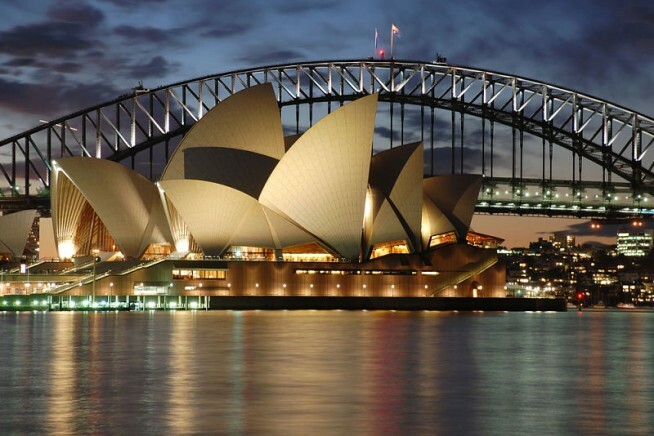 Is there any in your 2013's travel list? 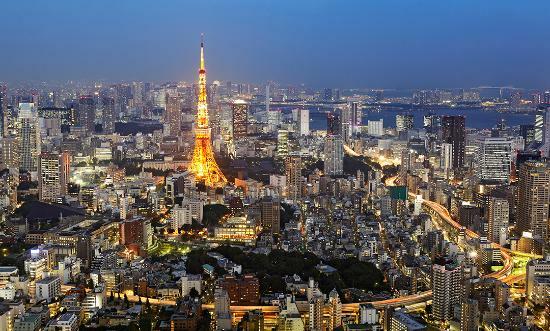 Find out why travellers have picked these cities to make them TripAdvisor's Travellers' Choice 25 Best Destinations in the World. Last week a few of us at the office were bending down helping a maintenance co-worker pick up some tools of his trade. He had accidentally spilled his toolbox of contents. Among the little knick-knacks strewn on the floor were nuts and bolts, hinges, Allen keys, screw-drivers and lots of washers rolling in all directions. I struggled to pick up what looked like a lock washer with my right hand but managed to pick it up with my left. hmm.. True. I'm more adept with my left hand when it comes to picking up small objects like pins, tacks and coins. I do play a mean game of saga seeds - with my left hand, of course. My right hand? Used for writing, bowling and other regular duties, including handling the mouse, the kind that sits beside the computer. I'd probably use both hands for grabbing raining money. Wouldn't you too? 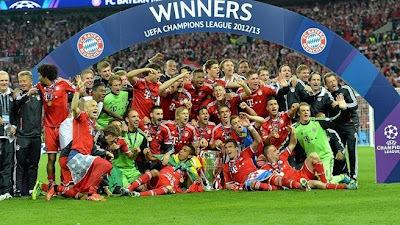 The UEFA Champions League final last night saw an all-German Champions League final on English soil at Wembley Stadium. 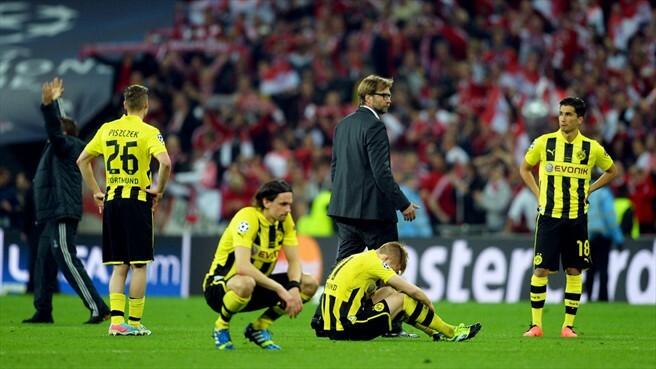 It was Borussia Dortmund vs Bayern Munich. Bayern Munich emerged winners after the brilliant combined moves of Robbery (a combo-name fondly dubbed by pundits for Dutch player Arjen Robben and French player Franck Ribery) in the final minutes of the game. Robben made it a 2-1 at the 89th minute to clinch the title for Bayern Munich. What a game! 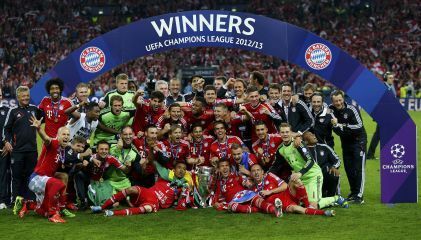 Congratulations to Bayern Munich, current Champions of Europe and for the fifth time! 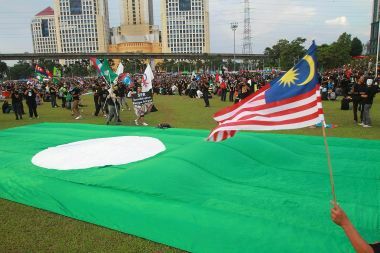 From The Star about the Pakatan rally held today at Dataran PJ..
PETALING JAYA: People are gathering in big numbers at Dataran PJ for Pakatan Rakyat's rally Saturday. 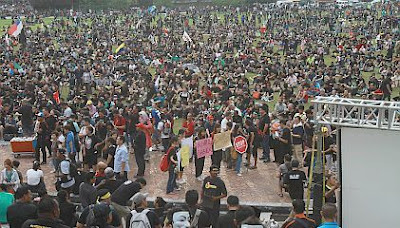 The rally is among several organised by the opposition to protest the results of the May 5 general election. Police have warned that the rally is illegal as they have not received the 10-day notice as required by law under the Peaceful Assembly Act. Home Minister Datuk Seri Dr Ahmad Zahid Hamidi has said that those that do not adhere to the act will "pay a heavy price" for their offence. The crowd, mostly clad in black, started to arrive as early as 4.00pm. The event proper started at 5.00pm with speeches from representatives of student groups and non-governmental organisations. 7.00pm: The crowd has been at its best behaviour thus far, sitting down on the field to hear the speeches. Traders continue to do brisk business selling drinks and knick-knacks. Penang deputy chief minister Rashid Hasnor tells the crowd to continue supporting Pakatan Rakyat in the next election. Touring New Zealand was an amazing experience, one huge adventure, really. 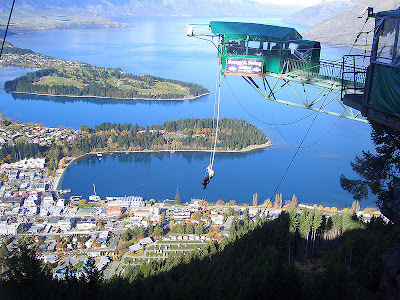 The more than two-week vacation took us from Auckland on the North Island to as far south as Dunedin, the principal city of the Otago Region in South Island. Along the way, our guided tour of South Island took us to other touristy cities and interesting places including Christchurch, Queenstown, Milford Sound, Mount Cook and the Franz Josef Glacier where we took a flight up on a small plane for a bird's eye view of the glacier and surrounding areas. That was awesome except that motion sickness spoilt the fun for me. My girlfriend and I spent five days in Auckland on free-and-easy mode. One of the days, we drove ourselves in a little blue Suzuki City to a Maori Cultural Centre. We were there just in time to catch a performance. Not sure how the organizers knew, they welcomed the two us by name on the PA system and mentioned where we were from. Well, that was certainly a surprise, we thought. The next few days, we did a little touring on our own of downtown Auckland, watched the beautiful sailboats at the harbour and visited the Kelly Tarlton Sea Life Aquarium - first ever experience of having sharks and giant stingrays gliding nonchalantly overhead. What's travelling without a little shopping, eh? So, we did some shopping for souvenirs for friends and family back home. We each bought paua shell products including rings, brooches and pendants, leather wallets and kiwi-feather purses. Strangely, at that time, we were not aware of Greenstone Jewelry otherwise we would surely have expanded my purchases to include them, but no matter, everyone loved their paua shell presents. Even though paua shells are synonymous with New Zealand, the range of nice products you can find in New Zealand nowadays include articles made from greenstone. Greenstone, also known as Nephrite (jade) and Bowenite (serpentine) is used to create many fine products. The Maoris call greenstone Pounamu and it is highly valued for its beauty and spiritual quality. The stone is shaped into ornaments, weapons and tools and over time acquired status as treasured possessions. 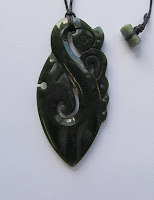 Take for instance this Maori jewelry Greenstone Jade Manaia Pendant. The Manaia is the carrier of supernatural powers. It is the spiritual guardian which protects the wearer from evil. This is a beautiful piece that is carved on both sides. Though greenstones come in various shades, this piece is black. From Auckland we flew south to Christchurch where we joined a South Island tour with a tour-group of about twenty of us comprising mostly Australians, three Americans and two of us from Malaysia. Like typical of all tours, we covered a lot of ground from city to city enjoying the different attractions each had to offer. At Christchurch, I remember most the beautiful Christchurch Cathedral and how I struggled to get the entire height of it into a shot. If you remember, the cathedral had to be demolished after the last quake a couple of years ago. Sad. The long drive took us past quiet woodlands, across country roads - where on one occasion, we had to stop to allow sheep crossing - to snow-covered fields of frozen dry flowers. This one at the Mount Cook National Park and is a sheer delight to see. We got down from the coach to pick the flowers (so many different kinds, shapes and sizes) with the intention of bringing them home but had to abandon the idea when we realised they were too bulky. Alas! We also passed by hills of those yellow flowers. Pretty sight. 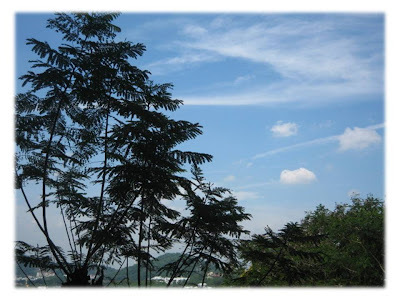 We put up at different kinds of hotels, some big resort type, others medium-sized but very comfortable no less. It was late September at the time so it was end of Winter/early Spring and the weather was still cold and windy. From the cold outdoors, the room heater was something we were thankful for once indoors. The hotel was properly insulated, of course. In places with cold climate, home insulation is necessary unlike here in our tropical climate where we need air-conditioning instead. Home Insulation means a healthy, warm, dry and energy-efficient home. 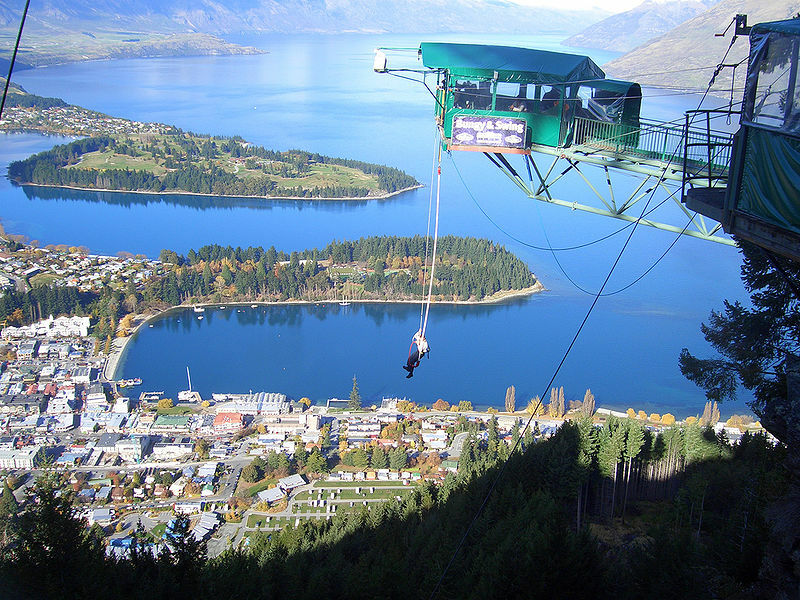 Beautiful Queenstown is not to be missed when you visit South Island and I wouldn't mind visiting Queenstown again but I can't say the same for Milford Sound. I find travelling such a long distance is not worth the prize at the end of the journey, maybe because our boat didn't take us out to the ocean to view dolphins. But I can at least say, I've been there, done that. Friday Frolics - How Are You Spiritual? Today being a spiritual holiday and all, let's take a quiz that's related to spirituality. Take the quiz to find out how are you spiritual. You are grounded, stable, and secure in who you are. You don't second guess your intuition. You would never be accused of taking yourself too seriously. You are able to lighten up when needed. You see the magic in each moment. You try to never take your life for granted. You're a bit of a flower child, and you love to be outdoors. You see nature as a gift. Last Week's Personality Quiz: Is Your Soul Hippie, Punk, or Goth? Today, May 24, is Wesak Day or Vesak Day. It is a Public Holiday here in Malaysia so we get a day off. Schools, banks, government offices, and admin departments in big corporations are closed. Attachment is a negative attraction that we succumb to, inside our consciousness, regularly and it gives rise to ego, which in turn is the root cause of all suffering. Suffering, in turn, is experienced at an emotional level through the various different forms of anger. We need to realize this phenomenon very deeply because this happens many times in each day of our lives inside our consciousness. Then we can see exactly from where our anger arises and we can correct it. So if we don't want to suffer from anger, the solution is simple - we don't get attached to anything or anyone, to any expectation, any particular desired result. Sounds difficult at first, but the same solution can be put in a way that would seem easier to achieve, we don't lose our spiritual identity or individuality in something we are not, in anything or anyone that is physical. That does not mean we shouldn't possess any material objects and not experience joy by using them. It also does not mean we start remaining aloof from people that we love. Nor does it mean we don't have goals and ambitions at the workplace, etc. We do. But our relationship with them changes. Our relationship becomes one of detachment and not of attachment. And what is a relationship of detachment? Detachment means that we possess all of them but we are no longer dependent on any of them, for our peace, contentment and happiness. We choose to be peaceful, content and joyful irrespective of whether they are there with us or not. So when cars get banged into (which can happen at times) and when people close to us are harmed or insulted or they leave or are separated from us due to any other reason (which is also bound to happen) or when jobs are lost (which is inevitable), we don't react angrily and suffer as a result. We have realized everything in life comes and goes; everything is born and comes to an end. We also realize that every process taking place in life is unpredictable and not always controllable, and must end. Things do and will happen. We know this is a reality. Every time we get angry it means we are having an argument with this reality of life. 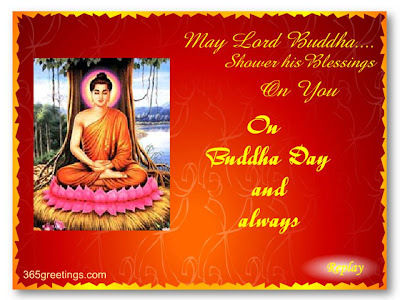 Happy Wesak Day. May your day be as peaceful and as beautiful as it can be! 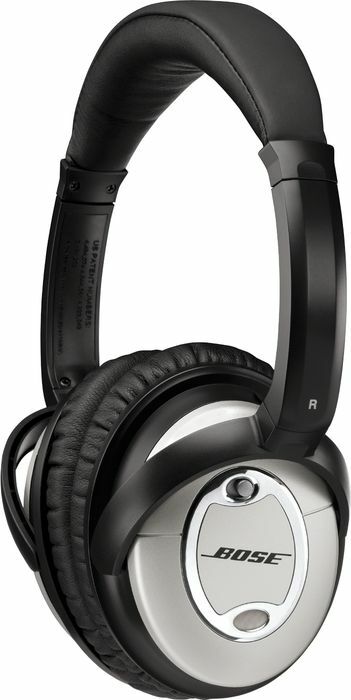 I've been checking out headphones in stores lately with the intention of owning a set. I never saw a need for headphones until now for some reason. The Internet is also where I'm looking and saw a selection of classic bose headphones. Bose headphones are among the best I was told. They are manufactured by Bose Corporation, a producer of headphones for consumer, aviation and military use. Their range of models includes in-ear headphones, mobile headsets, supra-aural headphones, circumaural headphones and military/aviation headsets. Bose Corporation is the first company to release active noise cancelling headphones as a consumer product. Not sure if I need a headphone with this noise cancelling feature but would certainly explore this option at the same time checking out the regular models. What brand of headphones, if any, are you using? Are you happy with what you are having? A recently passed Bill will see all 71 assemblymen and state Cabinet members in Sarawak enjoying a 300% increment in their monthly remuneration. This means that under the new Members of the Administration and Members of Dewan Undangan Negeri (Remuneration, Pensions and Gratuities) Bill 2013, the Chief Minister will earn a whopping RM39,000 a month from the current RM13,000. His deputy will get a raise in his remuneration to RM35,000 from RM11,500 previously. Second Finance Minister Datuk Seri Wong Soon Koh, who tabled the Bill at the Sarawak Legislative Assembly sitting here yesterday, said the remuneration adjustment was timely. 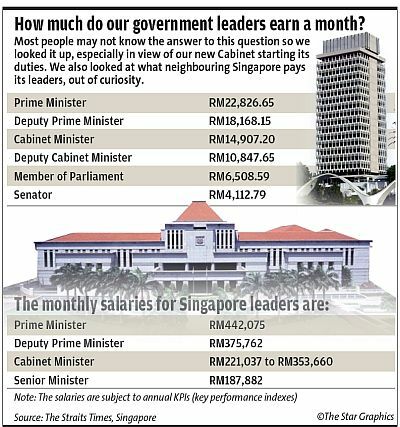 Elected Members of Parliament can earn up to RM10,000 in monthly perks and allowances. In the office, we can easily xerox this and xerox that. Funny, how a company name evolved into a verb, an action we perform almost instinctively whenever we need a copy made. Strangely, we even use the term on a non-Xerox duplicating machine! Great inventions like the Xerox machine has added convenience to our life. I was at a Malay wedding the other day and was admiring the general setup. Blue was the theme colour including the bride and the groom's attire. So much care and effort was put in from the wedding dais to the wedding favours down to the table setting - a pretty basket of flowers at each table, beautiful table cloth including table skirt held up neatly by velcro. Yes, velcro is one of life's modern conveniences. Did you know that it was invented in 1948? But I digressed. Back to the wedding.. the catered food was delicious. Nowadays, having catered food is the norm at Malay weddings which leaves valuable time for the family to look into other aspects of the preparation. 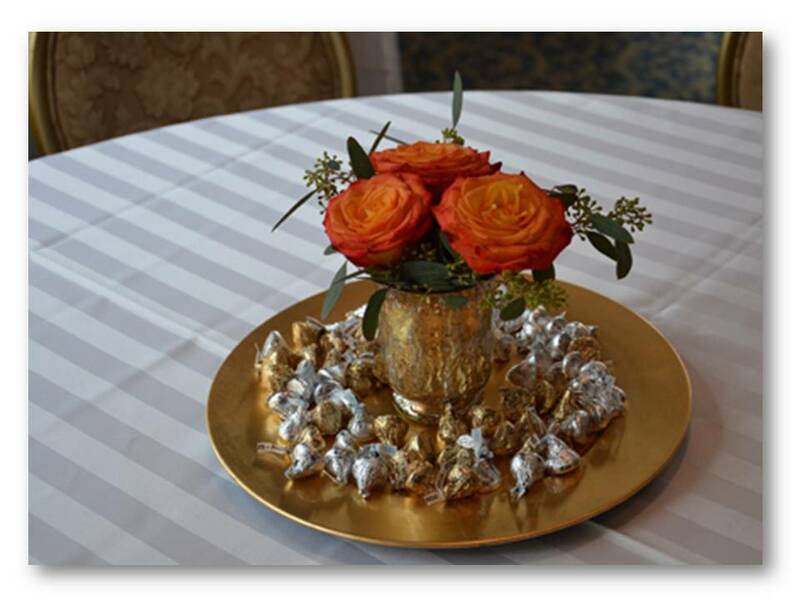 Not only was the food catered, the whole ensemble of the wedding set up had been outsourced to a wedding planner. Times have changed. For wedding favours, we came away with a traditional hard-boiled egg in a pretty wire-basket of blue and gold. These two weeks being school-holidays, we may be seeing more weddings in the offing. It's a beautiful day outside today. Kuala Lumpur is bathed in bright sunshine, blue skies and cottony balls of whitest clouds. 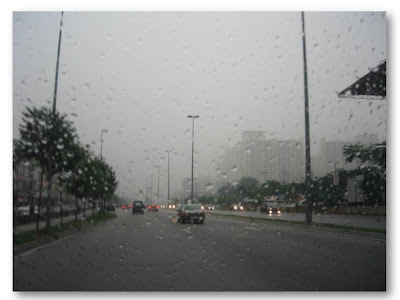 If you are visiting KL or Malaysia for that matter, an umbrella is a good friend. Not only do you need it for the rain, it comes in very handy on a sunny day. Here, let me show you the kind of weather we are enjoying today..
A little inspiration from SK's post about his recent visit to Tokyo. Following is an image of the junction at Bukit Bintang at night. 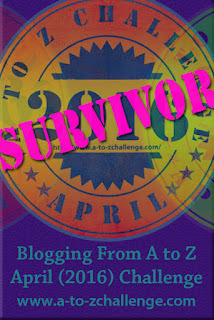 I do have a day picture of it but needs some looking. Nothing special about this crossing or junction except that this junction is extremely busy during the day and could be the busiest right in the heart of the Golden Triangle. This is where Jalan Bukit Bintang meets Jalan Sultan Ismail. A few years ago, this junction was named Bukit Bintang Crossing or just Bintang Crossing, modelled after the famous Shibuya Crossing in Tokyo. At the famous Shibuya Crossing, traffic lights all go red at the same time allowing pedestrians to cross over to the other side all at once. Considering the volume of people crossing the street at this junction, the city mayor decided to adopt the same style as the Shibuya Crossing and convert this busy intersection naming it Bintang Crossing. Not sure if it is still practised today because there is not much publicity about it nor any indication anywhere near the crossing. You may want to rope in some friends to check it out. But just be careful though. The name Rickenbacker was unfamiliar to me until I saw it on a guitar brought into the office by a visiting colleague. He wanted to have it fixed by a friend here who is in the guitar-making business. Rickenbacker International Corporation, also known as Rickenbacker, is an electric and bass guitar manufacturer based in Santa Ana, California. In 1932, the company became the world's first to produce electric guitars and eventually produced a range of electric and bass guitars. Rickenbacker benefited tremendously during the 1960s when a couple of Rickenbacker guitar models became permanently associated with the sound and look of The Beatles. Over the years, The Beatles' extensive use of Rickenbacker guitars helped in their popularity. Rickenbacker guitars and basses continue to be very popular to this day with demand persistently and exponentially outstripping new factory supply. Demand is particularly high amongst retro groups who have been influenced by the sound and look of the 1960s. What a glorious day it is today. By contrast, yesterday was just the opposite, weatherwise, that is. 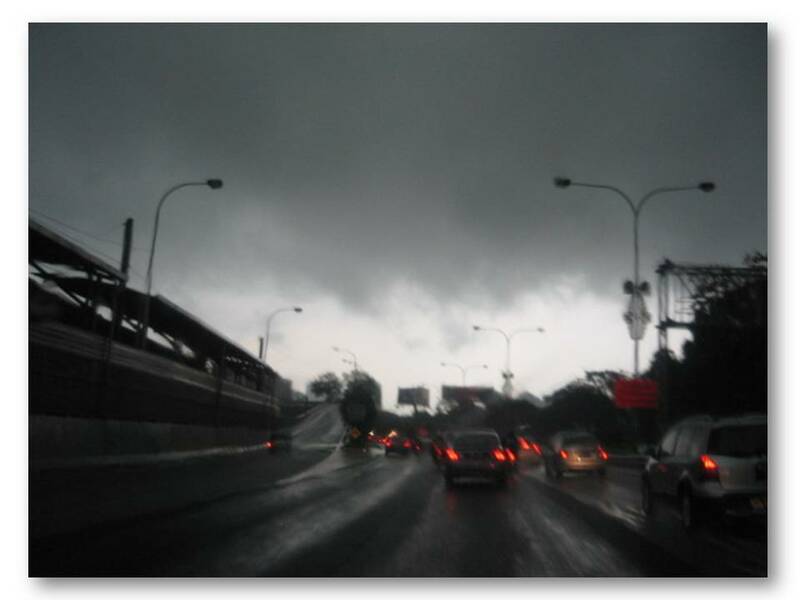 Let me show you the kind of weather it was yesterday in Kuala Lumpur as well as take you on a little tour of the part of the city where I went to. Bummer! What a weather to start the day but the thought of it being Friday helped. Then soon enough it turned dark and ominous, like a dark and sinister blanket overhead. Further into the city, the weather got better allowing some more pictures to be taken. I wanted to show you a little bit of this part of Kuala Lumpur, the part that glitzy travel magazines don't often feature - mainly because it's the older part of the city (as opposed to the Bukit Bintang area) and practically no significant tourist attraction here. However, this part of town is a local shopper's paradise when it comes to bargains and range of products. 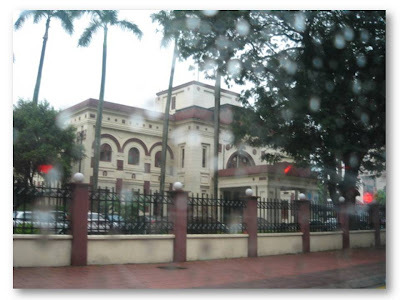 As a tourist, you may notice that the colonial past is still present in Kuala Lumpur as well as in other parts of the country particularly in the building architecture. This is the Medical Research Institute converted from an old colonial building. 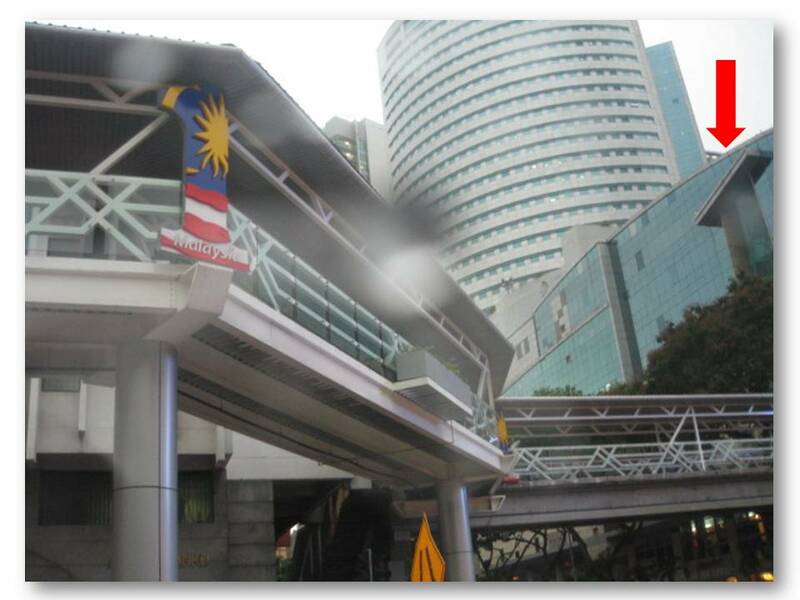 It is located near the KL General Hospital (which is further down the road to the left in the other direction). Moving further down the street to the right of the above picture, we come to a junction of crossroads branching out to various parts of the city. Being an older part of the city, prewar shophouses like the ones in the picture below are still a part of the landscape of this part of town. 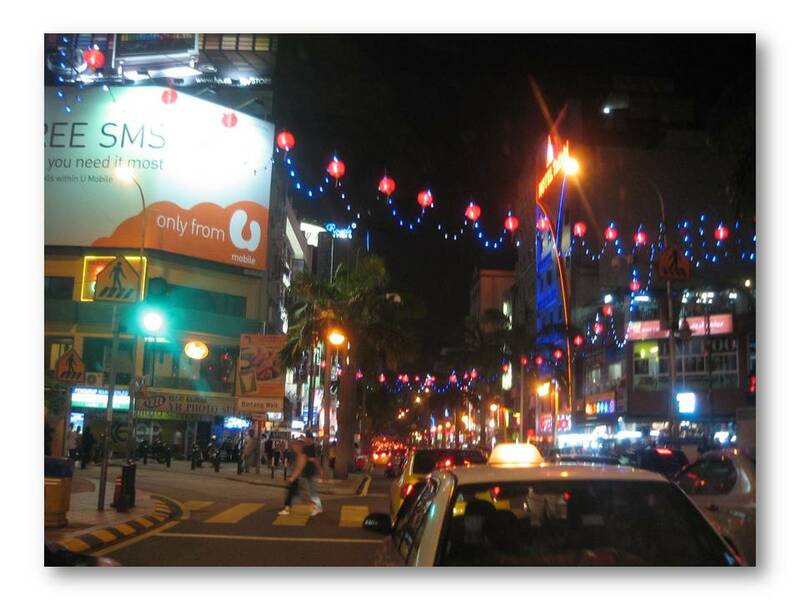 Come Hari Raya (Aidil Fitri) and Deepavali (Festival of Lights), this part of town becomes bustling with activity just like Chinatown during Chinese New Year. You can find practically everything here from day-to-day products to wedding paraphernalia to popular festival items such as regular items like clothes and shoes to headwear (including and especially songkok) to fabrics for clothes and curtains, rugs and carpets, gold jewellery, you name it. In this area there is a huge wet market, Chow Kit market, which serves a wide clientele from humble homes to restaurants. A good place to check out if you like going to markets. 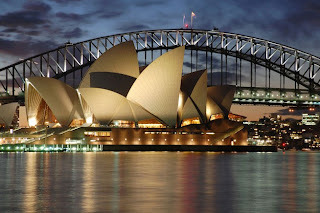 It opens every day of the week from pre-dawn to dusk and into the night though I'd advise going there during the day. More prewar shophouses. In fact, they flank both sides of the street. 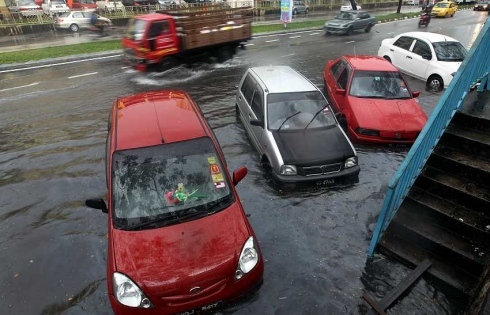 This street used to be called Batu Road. There must be a reason for it being named such as 'Batu' means stone in the local Malay language. Notice 'Road' instead of 'Jalan' the local version. We can only conclude that this road name was coined during the British colonial times. 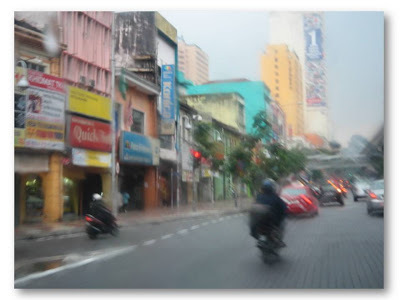 Today, this street is called Jalan Tuanku Abdul Rahman after Malaysia's first Prime Minister. 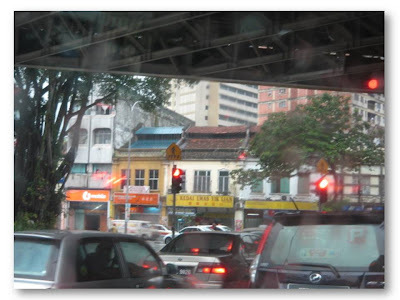 Jalan means road or street in the local Malay language and Jalan is placed ahead of the name. Prewar shophouses.. Apologies for the blur image..
My stop yesterday was at Jalan Sultan Ismail. Jalan Sultan Ismail is in the Golden Triangle and home to a number of 5-star hotels in the city. 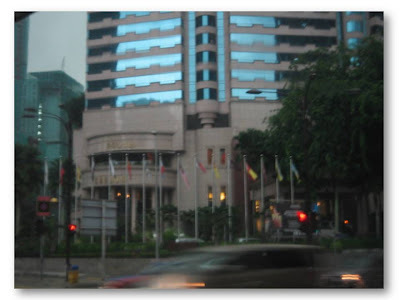 If you were coming from Jalan Tuanku Abdul Rahman, as mentioned above, you would pass by the Renaissance Kuala Lumpur on the left (though this hotel is at the junction of Jalan Sultan Ismail and Jalan Ampang (where the Petronas Twin Towers are) and next to Renaissance is New World Hotel. This is the facade of Renaissance Hotel taken yesterday on the way back.. Crossing over the intersection with Jalan Ampang onto Jalan Sultan Ismail is the Concorde Hotel, also on the left side. (Incidentally, here in Malaysia, we drive on the left side of the road.) Hard Rock Cafe is located in the Concord Hotel. Equatorial Hotel (now under renovation) is closeby. On the opposite side of the road is Shangri-la Hotel. 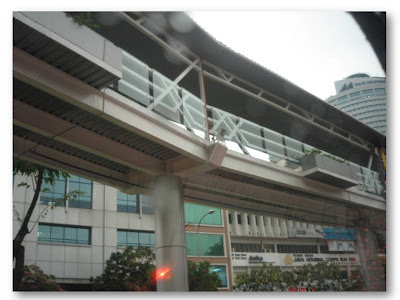 There is a monorail station nearby as well as an LRT (Dang Wangi) station. On the way back to the office, my drive was along the same route. Visibility was still affected by the weather (remember it is still early part of the morning) which requires cars turning on their headlights. What caught me by surprise here was the pedestrian walkway on the left, which only goes to show how long I've not visited this area. This covered walkway meanders over a few streets and a lot safer for pedestrians not having to battle auto-traffic down below. The structure on the right is the monorail track. This was taken near Sheraton Imperial Kuala Lumpur hotel. This is still along Jalan Sultan Ismail, the tail-end. A closeup of the nice walkway.. 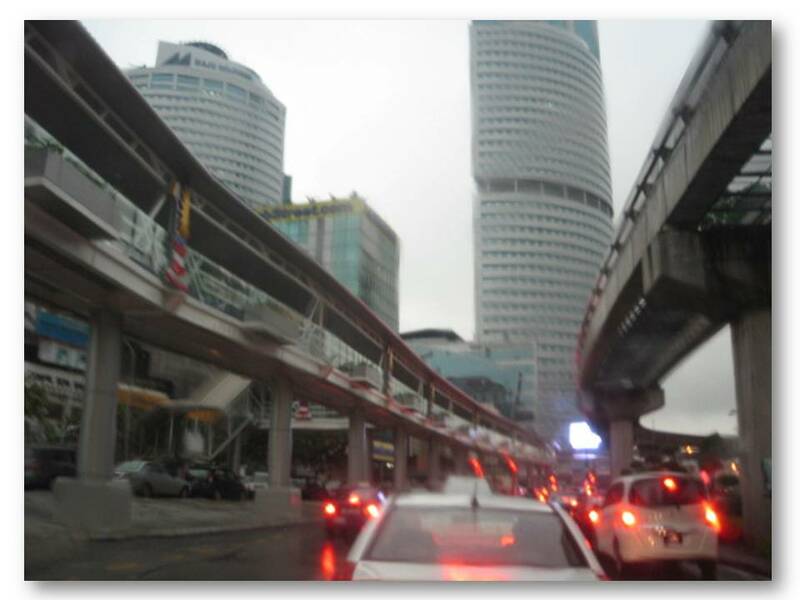 I've often read about Maju Junction but have not been there. This is a new shopping complex this side of the city. The complex houses a few government departments including the Road Transport Department. 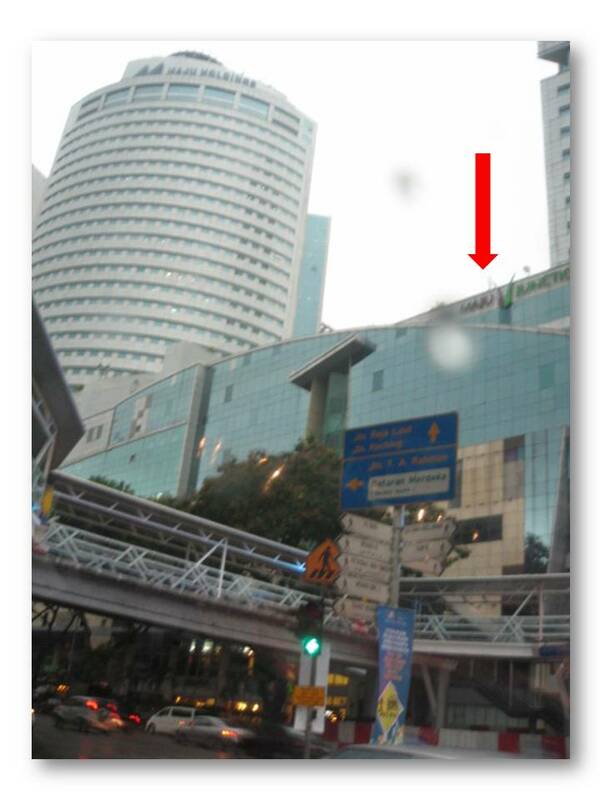 The building is shown below the red arrow in the following picture. 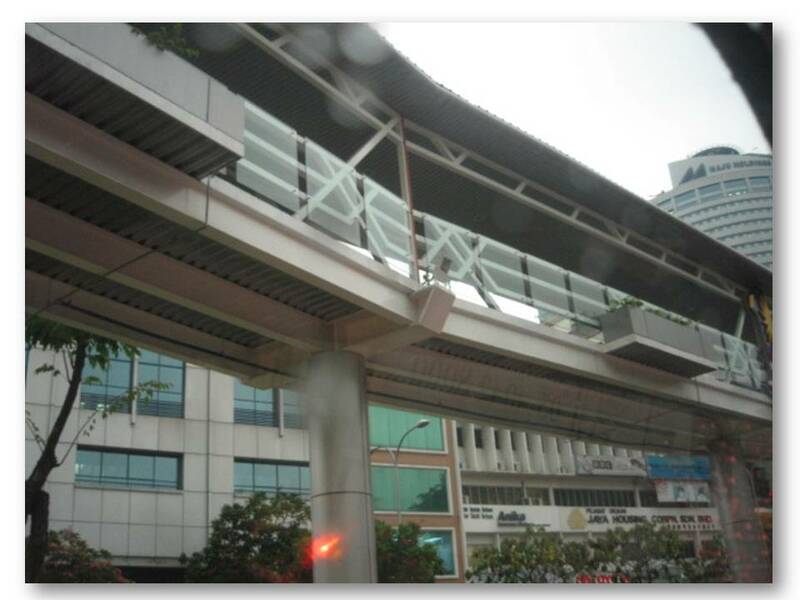 Notice the covered pedestrian walkway extending right up to this Maju Junction. Very neat! 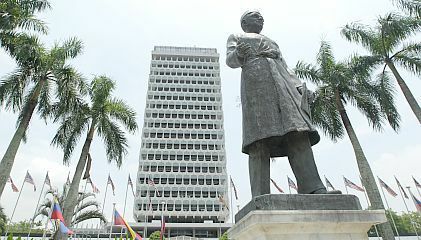 If you intend to visit Kuala Lumpur, the next landmark in this area may interest you. 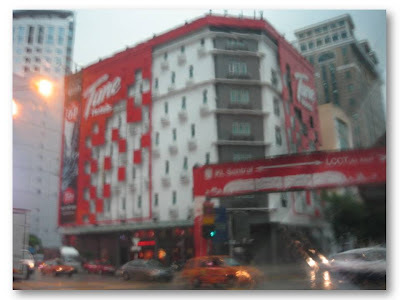 This is the Tune Hotel, the only one in the city. It is right opposite Maju Junction which is an ideal place to stay if you are looking for a nice hotel on a budget. How convenient is that! Forgive shaky hands..Maju Juction is across the street on the left (not in picture)..
Virgin chief executive Richard Branson made his debut as a female flight attendant this weekend, donning a stewardess' uniform and serving drinks to passengers after he lost a bet with a fellow airline magnate. The Virgin Group founder was honoring a bet made with Air Asia's CEO Tony Fernandes over whose team would win the 2010 Formula 1 Grand Prix in Abu Dhabi. 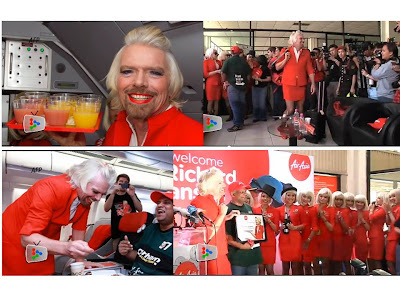 Shaving his legs for the bet but keeping his beard, Branson wore heels, false eyelashes, makeup and red lipstick while serving customers on an Air Asia flight from Perth to Kuala Lumpur. 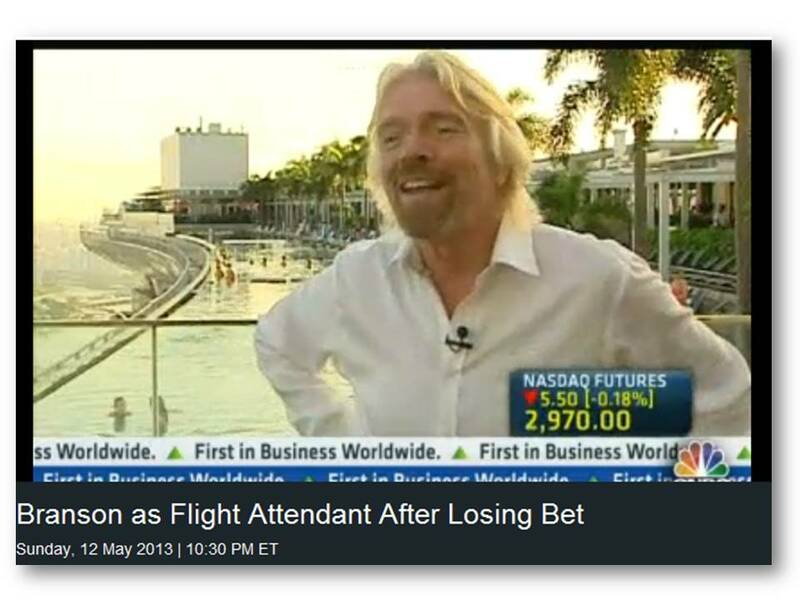 The interview by CNBC with Sir Richard was conducted in Singapore. Could that be the iconic rooftop Sands SkyPark infinity pool at the Marina Bay Sands hotel behind Sir Richard? Friday Frolics - Is Your Soul Hippie, Punk, or Goth? You're neither a leader nor a follower. You own your own blissful path. Last Week's Quiz: How Should You Change The World? After the controversial win at the recently-held General Election, Prime Minister Datuk Seri Najib Tun Razak announced his new Cabinet line-up on Wednesday saying that it was a balanced Cabinet made up of ministers who were a mix of the experienced, technocrats and the young. He retained Tan Sri Muhyiddin Yassin as his deputy. The new Cabinet will be sworn in at 3pm on Thursday. Have you heard of Groove Juice? A colleague bought a piano for her son who recently started piano lessons. She's glad it's the piano that he's interested in instead of drums. She's actually concerned about the maintenance part of the musical instrument when she said that. While the maintenance of a piano is by a piano professional technician, a drum set is not, she thinks, or at least the cymbals need to be cleaned every now and again to get rid of the dirt and give them back their shine. No cause for worry, I thought, because nowadays there are good cleaning liquids available that are able to do the job with less effort and in a shorter time too. Groove Juice is one such product I saw online the other day. All you need to do is to give the cymbal a spray or two, let it sit and then scrub it off with either a kitchen pot scrubber or a toothbrush. 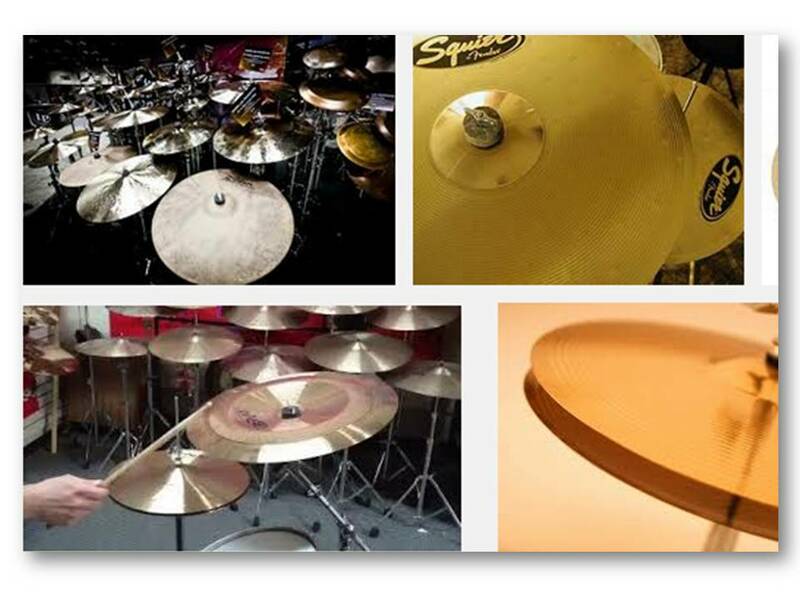 The cymbals will come out as good and shiny as new. The ad says it doesn't smell awful as there is no ammonia in it. If I own a drum set or cymbals, I would certainly buy groove juice. For that price and the work it does, I'd be crazy not to give the product a try. If you are a fan of the Kardashians, their clothes, their reality tv shows, and if you are in the UK, here's a chance to grab a copy of the Fabulous Magazine of the three Kardashian ladies (Kourtney, Kim and Khloe) on the cover which features them wearing their new Kardashian Kollection for Dorothy Perkins. Or get the magazine free this Sunday with The Sun newspaper - in the UK. I'm seeing a spike in blog traffic today (which actually started last night) from keywords relating to Manchester United Champion 2013. Surprisingly, the bulk of the traffic comes from Great Britain and Indonesia, the latter a real surprise. Local Malaysia traffic comes in third. It happens. Sometimes we write a post that hits an interest level at the time and the post could even remain as one that constantly gets traffic over the months, years even. These are posts that make it all worthwhile, you know what I mean. As for the match last night between Manchester United and Swansea City at Old Trafford, it was a good game to watch but the highlight of the night was the trophy presentation after the game. 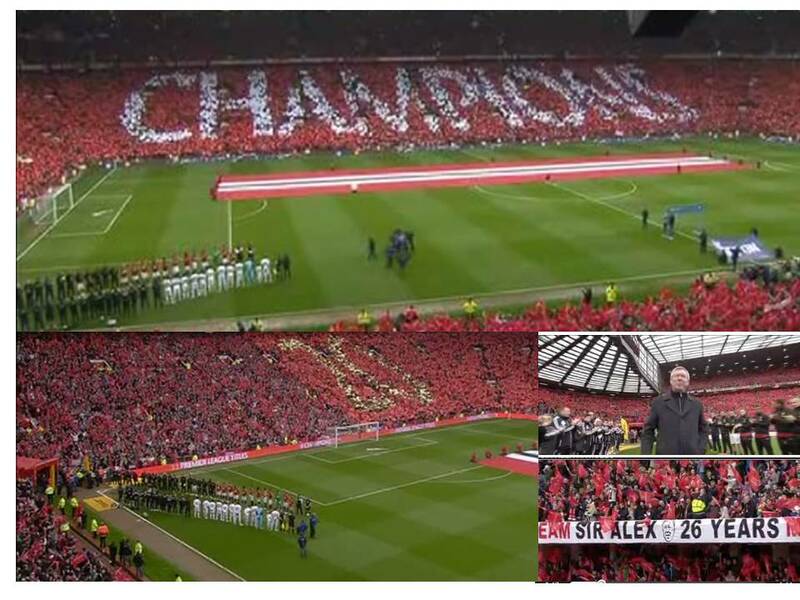 Last night's game was the 723rd game and the last game for Sir Alex Ferguson for the Old Trafford club. David Moyes takes over from the next game on May 19 which is the last match of the season in which MU will play West Brom. If MU wins this game, it will bring them to 91 points, just one point shy of their highscore of 92 during their 1993/94 season and the same score as their 1999/2000 season. At one point, MU looked set to break the record of 95 which was set by Jose Mourinho's Chelsea side in 2004/05. It was a 2-1 match win for MU last night with a late 87-minute winning goal by defender Rio Ferdinand whose last goal was scored in Jan 2008, if I remember correctly what the commentator said. It's memorable for Ferdinand that being the last game for Sir Alex. Last night was also the last game for Paul Scholes who retires the same day as Sir Alex and which he (Sir Alex) acknowledged in his farewell speech. 'Nuff said. 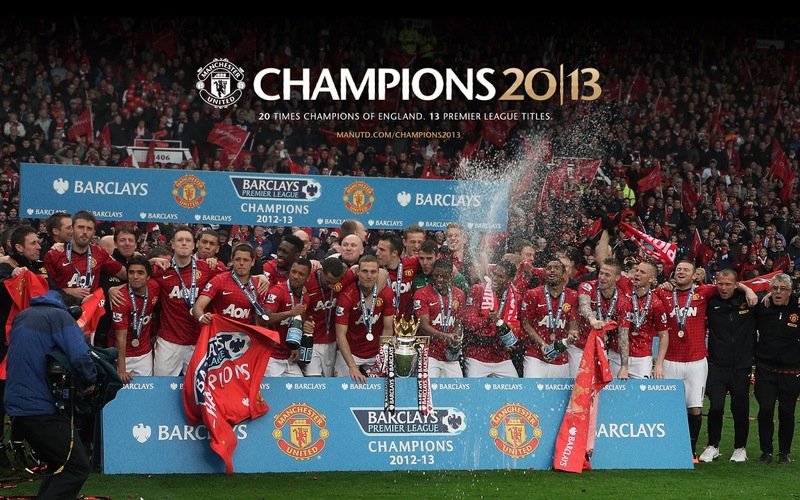 If a picture tells a thousand words, here are a few thousands and more on the Manchester United website. 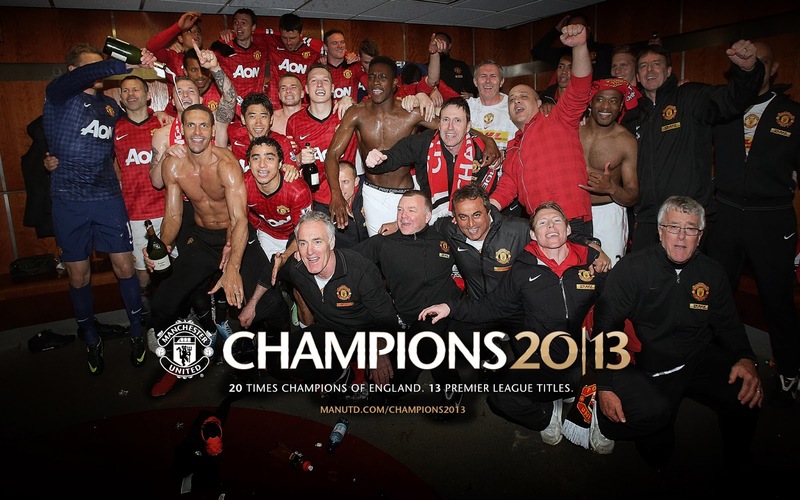 Enjoy the celebration (MU supporters), albeit virtually..
Manchester United Champions 2013, also their 20th Premier League trophy..
Two more matches to go before we come to the end of yet another great English football season especially for fans of Manchester United the latter who are the Champions this season. Yes, Manchester United are the Champions for 2012/2013 season. This is their 20th Premier League title. 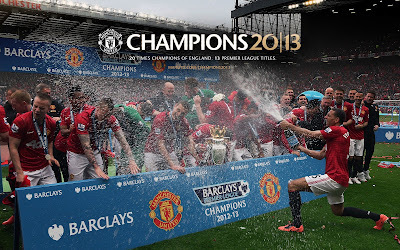 Check out photos of the trophy-presentation and celebration at Old Trafford..
Manchester United will be receiving the Barclay's Premier League trophy after the (last home) game tonight with Swansea at Old Trafford. The game starts at 11pm Malaysia time. 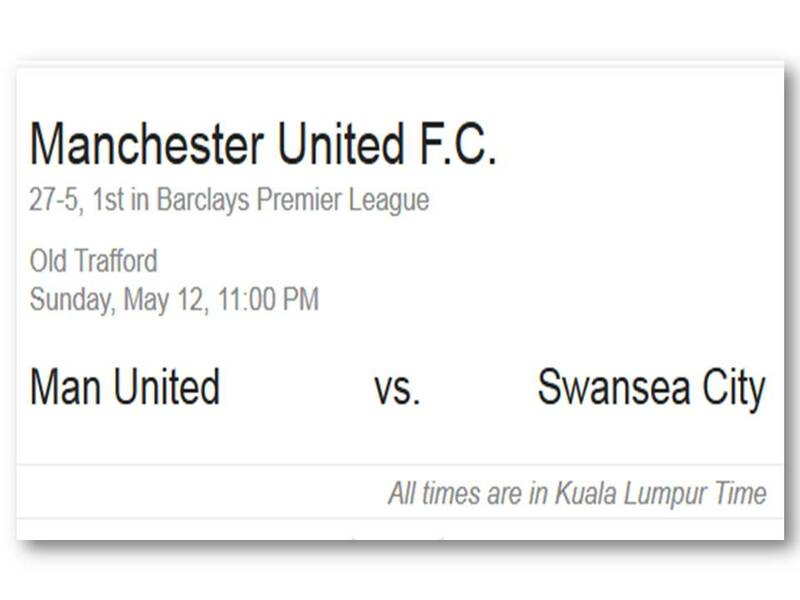 Mamak stalls and pubs tonight (Bangsar area comes to mind) will be packed with patrons filling tables anxiously waiting for the jubilant trophy-lifting moment, a significant event in any club's history. 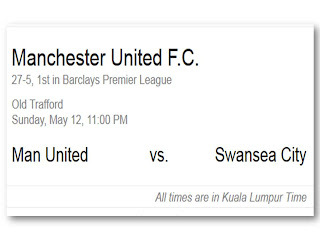 In Malaysia, watching an English Premier League game is ingrained into the Malaysian culture. MU will play the last game of the season next week on May 19 against West Brom. 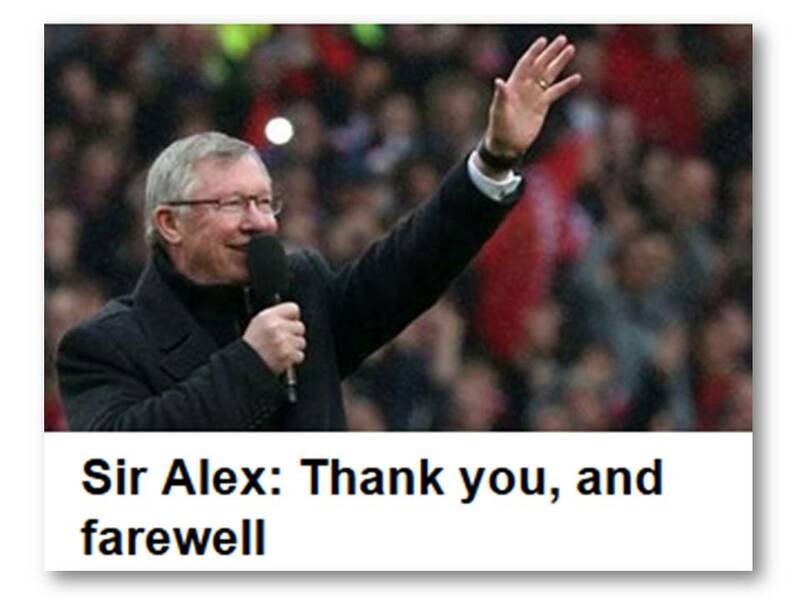 Tonight's game will be the last for Sir Alex as manager of the club. Sir Alex retires from Manchester United after almost 27 years with the club since he joined on Nov 6, 1986. He will remain at MU as director and club ambassador. As one who has been instrumental in the club's success, Sir Alex's announcement of his leaving some two weeks ago had an impact on MU's stock price. The club’s share price fell as much as 3.5 percent in early trading in New York within hours of the statement from Britain though it recovered some and was down 1.44 percent in afternoon trading. 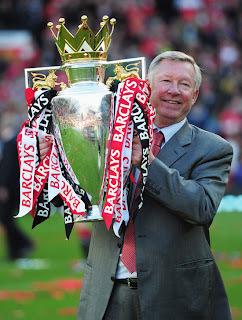 Ferguson has seldom missed a day on the training field, much less a night in the competitive arena, whereas a coach his teams accumulated 49 trophies — including 13 seasons as England’s champion but only two, in 1999 and 2008, as the Champions League winner. Who will succeed Sir Alex? There were a number of club managers who were being speculated to succeed Sir Alex. NY Times' list includes Real Madrid's Jose Mourinho, David Moyes of Everton, Ole Gunnar Solskjaer formerly of MU, Pep Guardiola, Jürgen Klopp of Borussia Dortmund and a few other honourable mentions. If you had put your money on David Moyes, you would have won as David Moyes, 50, a fellow Scot, has been named to replace Sir Alex. He takes over in July. Ferguson, knighted in the British custom for outstanding service to his ‘'industry, faces surgery when this season is done. He will undergo hip surgery in August. Friday Frolics - How Should You Change The World? Celebrity Fashion - What were they thinking? Friday Frolics - What's Your Motivational Phrase? Happy Labour Day and Happy Birthday!